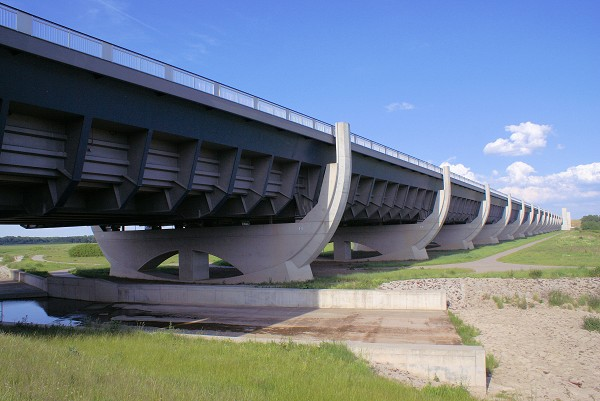 What is our perception of a bridge? We have seen bridges being designed to cross motorways, rivers, and valleys, etc, but mostly to carry the people and vehicles from one side of the obstacle to the other. These are occasionally designed to carry small water channels (known as acqueducts). 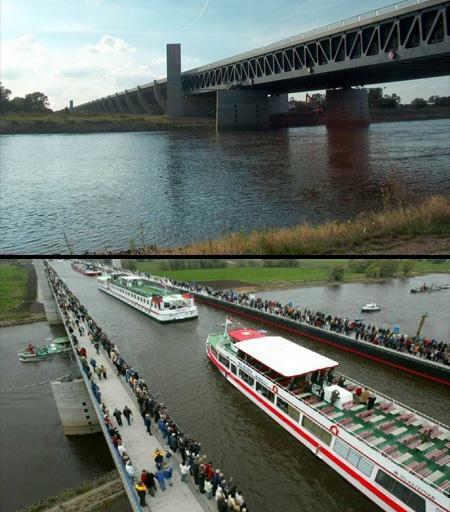 However, Magdeburg water bridge in Germany have really crossed the boundaries of conventional bridges by connecting a massive canal over Elbe river. It is the longest navigatable aqueduct in the world, with a total length of 918m. As seen in the pictures, it carries not only the water but also quite heavy boats over the river. Before the bridge was constructed in 2003, the Ships moving from one side to the other side across the river had to make a 12-kilometre (7.5 mi) detour , because the level difference between the two was significantly different. This massive structure was built using 24,000 metric tons of steel and 68,000 cubic meters of concrete and costs at around €500M.